In Praise of Satan… and Hell, Too! Whether part of a larger universal plan guided by some unseen hand or simply a trivial point of human history, Satan was not a part of my formative years. As my independent personality, values, and beliefs first began to develop in the late 60s and then were further refined through the 70s, it was other factors and inputs that held sway. Satan didn’t exist in any tangible way in my world during that influential time. Like many of my peers back then, I was drawn to the music of Black Sabbath and got a kick out of creepy movies like Rosemary’s Baby and The Omen. In fact, as I think back now, I smile at how these particular entertainments, together with “strange but true” and “scary tales” style paperbacks contributed to many memorable, thrilling experiences with friends – followed by surges in nightlight use — as we worked ourselves up around campfires or during sleepovers with proffered “what ifs” on the idea of the devil acting in the physical world. But all this is beside the real point I seek to make here, which is that Satan had no influence in my life or personal evolution during those years. Looking back from today’s position of informed self-awareness, I can recognize now that, within a year of my graduation from high school in 1982, there existed a real possibility for me to have actively sought out and benefited from direct knowledge of Satan. Unfortunately, this realization is solely in hindsight. If I’m being honest, I must admit to having been completely oblivious to Satan’s offerings and potential to enhance my life back then. I was trapped in ignorance; ignorance that it turns out would continue for decades. 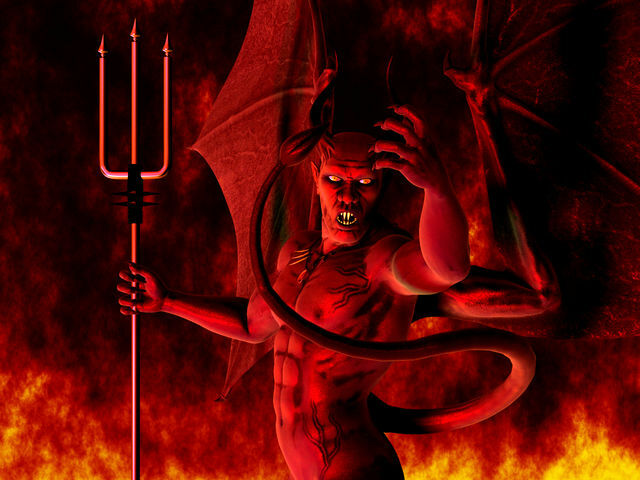 An artist’s depiction of Satan (from leftbehind.wikia.com). Not really what I’m trying to convey here. If it was simple obliviousness that initially kept me from Satan’s gifts, it was subsequently my missionary experience, undergraduate studies, marriage, grad school, child-rearing, and the work to establish myself in my chosen career field that combined to keep me too busy and otherwise focused to allow for Satan to enter my life. A concurrent lack of disposable income, free-time, and available energy conspired to mute my otherwise inherent exploratory nature. Even when I did eventually become comfortable enough to begin tentative efforts at expanding personal horizons roughly around the time of my first extended overseas work assignment in 1997, I tended toward revisiting past predilections that had gone by the wayside over seeking out completely new alternatives. As such, Satan remained an unconsidered option. It was only circa early 2012 while serving in La Paz, Bolivia, that I finally made my way into Satan’s welcoming waters. It was the internet that opened the door to Satan for me. There was no specific “eureka” moment, and truth be told I cannot recall any specific instant of discovery, but I somehow found Satan there among the murky blogs and other endless obscurities that inhabit the virtual ether. A mention here led to a click there, and curiosity grew as I pushed deeper into available testimonials, some breathlessly sophomoric and others remarkably erudite. I continued my hungry search for further information until one day, fatefully, I made the decision to stop simply vicariously consuming the opinions/stories of others and to take the steps necessary to bring Satan into my own household. In the Hollywood version, the next chapter in the story would involve an immediate, life-changing epiphany, but that’s not what happened. I did commune with Satan, and I definitely enjoyed it. However, I was able to truly lose myself in the experience only occasionally, usually in the dark of my closed-door study or when finding myself temporarily alone in the house. I was hindered by the fact that my conservative, God-fearing wife would not have approved. As a result, no full-on embrace of Satan came about from those initial explorations. Other things soon began to fight for my attention, eventually pushing Satan once again into the background. As an aside, I’ll note here that concurrent with those first forays into Satan’s offerings, I began to read intimate treatises on Hell for the first time. I was intrigued, but never delved deep enough to understand the reality of Hell as a viable option for me. I imagined Hell’s realm as filled with the shrieking screams and the grinding, tortured atmosphere that appealed to those with a proclivity for death. As a result, I made the assumption that Hell wasn’t for me and opted out of a more dedicated investigation. 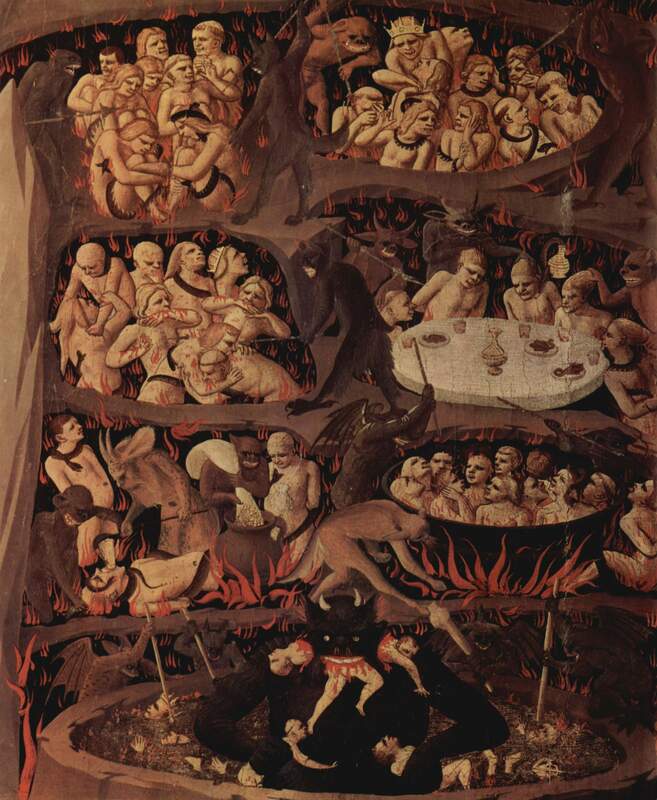 Fra Angelico’s 15th century vision of Hell (from wikimedia.org). Again, not really reflecting what’s in my mind as I type this. Fast forward to early 2015 when I returned home following an intense year in South Asia and began an extended leave of absence between assignments. I suddenly found myself awash in available time, with my mind freed to float temporarily unencumbered wherever the wind carried it. Whether by fate or chance, I was drawn back to Satan shortly after my arrival. Picking up where I had left off in Bolivia some two years prior, I quickly sensed that it wasn’t enough; I had to go deeper. I headed back into those obscure corners of the internet where I was sure a path forward would make itself known. It took no time to discover that there was indeed a new, promising avenue for expanding Satan’s role in my life. What’s more, the exploration unexpectedly turned up separate material that led me to reconsider my previous dismissal of the idea that adding Hell to my “portfolio” could also bring emotional benefit. Giddy with anticipation, I jumped in with both feet. I proclaim loudly here, dear readers, that finally bringing Satan and Hell fully into my life has proven a glorious choice. Moreover, I recommend enthusiastically and without qualm that any who have yet to do so free themselves from ignorance and join me on the bandwagon. 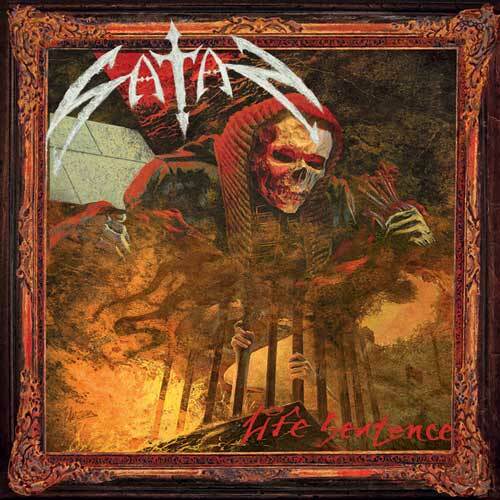 In fact, now that I’ve received Satan’s 2013 album Life Sentence into my CD collection and listened to it multiple times both on headphones and in the car, I feel comfortable asserting it as among the very best old school metal offerings of recent years. 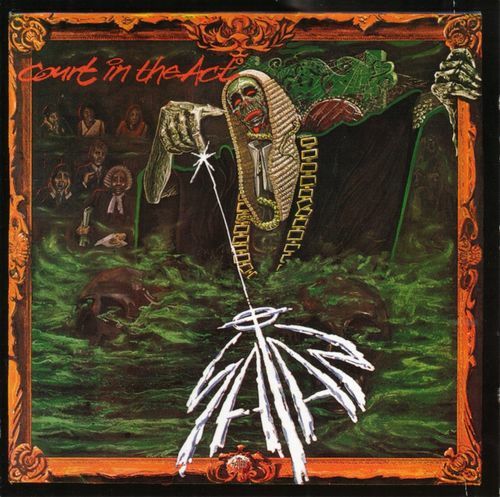 In additionally going back more attentively to Satan’s first album, 1983’s Court in the Act — of which as mentioned above I sadly only became aware circa 2012 while living in Bolivia — I now find it hard to understand why I didn’t embrace it more fully when I first bought it. As for Hell’s Curse & Chapter, also released in 2013 but only added to my library now, it turns out it is not death metal at all, as I had incorrectly believed, but instead is the kind of straight ahead heavy metal that has always tickled my aural fancy. Both Satan and Hell boast a semi-theatrical vocal style that appeals to my interior metal nerd but is nonetheless understated enough so as to not come across as affected farce. Each band offers up ample meaty guitar riffage and relentless hammering drums within a soaring melodic structure that reinforces their early 80s NWoBHM origins but without sounding dated. These are definitely NOT throwback nostalgia acts; they are vibrant modern practitioners of rousing heavy (non-extreme) metal. I have no doubt that, now that I have embraced them, Satan and Hell will be in my life for a long time to come. They should absolutely be in yours too! Haha great post. Big thumbs up from me for Hell. I absolutely love them. Just saw them live for the first time before Xmas. I’ve been meaning to buy Life Sentence for so long now it’s getting a bit ridiculous. I do have Court in the Act but I’ve never been totally sold on it. Yeah, Court in the Act is doing more for me now than it did initially. Man, I’d love to see Hell but it doesn’t look like their coming to the States is in the cards anytime soon. I am really enjoying this latest CD. Do you have the first one, Human Remains? If so, do you recommend it? Yes it’s excellent. And get the 2CD edition as the bonus disc has the archive recordings of the original band in the early 80s. I did listen to Court in the Act this week actually and enjoyed it more than usual so there’s definitely hope for it. When Life Sentence came out I heard a track online and it was really good so I’ve got no excuse for not buying it yet. Here here! Excellent post! I have never had Satan in my life and since yours and other blogs have made Satan’s presence more known to me, I am going to have to look for Satan. Proselyting for Satan, my latest gig! All Hail Satan! Praise Hell! How could I have missed this testimonial? Was it some remaining vestige of churchy doctrine that made my eyes avert in an involuntary avoidance of the lure of Satan-ic corruption? Whatever. Loved it. Even enjoyed one of the clips. (smile). Did someone once say, ‘Evil is banal’? Can’t say I believe in those terms (good and evil, I mean, not banality; that’s hard to refute), yet been thinking ’bout you mate. Hope you’re coping with the modern world. Many thanks for the visit and the comment, VC. Must say though, I absolutely believe in evil, maybe not as emanating from some external source, but certainly as a real internal motivator for some. If only it could be blamed on a “Lucifer,” it might be a lot easier to root out. All that aside, the good news is that Satan himself is not banal; he’s a freaking blast! Long may He (and this particular band that’s taken his name) rock!! !